Now this caught my attention because it seemed to be about, well, multidrug resistant bacteria found in hospital sinks. It seemed to be about that topic because that is what the Tweet stated and that is what the headline of the press release states too. Now it turns out the headline in the Tweet and the press release from ASM is quite inaccurate. The paper is not about multi drug resistant bacteria or spread to patients. Bummer. And annoying too. But after getting over my annoyance I realized, the paper certainly seems to be quite interesting. The authors created a physical model of transmission from sinks and made use of a fluorescent protein expressing E. coli strain to aid in the tracking. There have been an increasing number of reports implicating Gammaproteobacteria often carrying genes of drug resistance from colonized sink traps to vulnerable hospitalize patients. However, the mechanism of transmission from the wastewater of the sink P trap to patients remains poorly understood. 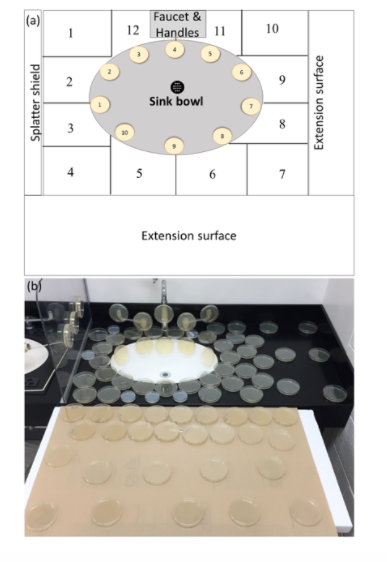 Herein we report the use of a designated hand washing sink lab gallery to model dispersion of green fluorescent protein (GFP) expressing Escherichia coli from sink wastewater to the surrounding environment. 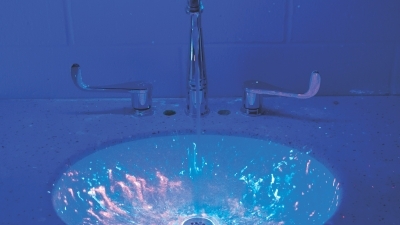 We found no dispersion of GFP-E.coli directly from the P-trap to the sink basin or surrounding countertop with coincident water flow from a faucet. However, when the GFP-E.coli were allowed to mature in the P-trap under conditions similar to a hospital environment a GFP-E.coli containing putative biofilm extended upward over seven days to reach the strainer. This subsequently resulted in droplet dispersion to the surrounding areas (<30 inches) during faucet operation. We also demonstrated that P-trap colonization could occur by retrograde transmission along a common pipe. We postulate that the organisms mobilize up to the strainer from the P-trap resulting in droplet dispersion rather than directly from the P-trap. 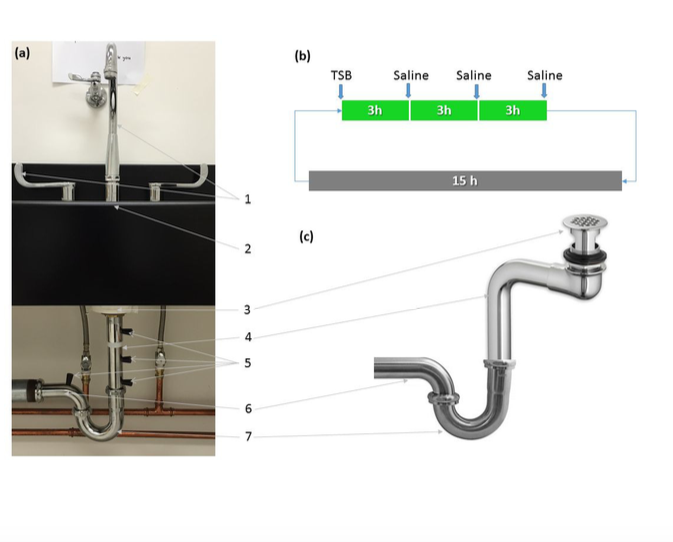 This work helps to further define the mode of transmission of bacteria from a P-trap reservoir to a vulnerable hospitalized patient. So – the misleading PR is annoying but the paper is worth a look. The paper can be found here. @phylogenomics @ASMnewsroom Thank you –we agree that the title is misleading and have corrected it to be more accurate. Retrograde transmission along a common pipe. This is NEW? First put forward in the 80’s regarding other more common opportunistic pathogens (OP’s) means of contaminating a hospital’s domestic hot water systems (HDHWS’s).